I really love salads, especially ones that are simple to put together. If you were to look up the definition for the word salad I bet you would be surprised by the various definitions that are out there depending on your resource. Many definitions loosely describe a salad as a cold dish consisting of leafy greens and vegetables, raw or cooked. Though that particular interpretation sounds wonderful I think that salads have come a long way and many times can be a complete dinner. Today leafy greens, veggies, grains and seeds of every kind, meats, seafood, eggs and ferments can be added. Even though there are so many different combinations, sometimes I need help or a mental nudge to help me put together a salad that day. 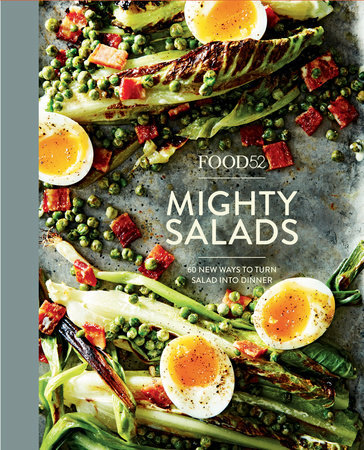 Introducing “Food52 Mighty Salads” a cookbook, that has been put together by Amanda Hesser and Merrill Stubbs, the co-founders of Food52. The salads are organized into leafy salads, less leafy salads, grains and beans, pasta and breads, fish and seafood and meat salads. There are over 60 recipes and almost all have stunning photos to depict them. The first salad I made was the, “Sort of Tabbouleh with Jammy Onion Vinaigrette”. Now I did not follow the instructions exactly but what is nice about these recipes it that they can be a jumping off point for the ingredients that you do have on hand. For the jammy onion vinaigrette I used a garlic and onion jam that I had picked up at Trader Joe's. The base was kale from the garden, (my first kale harvest this summer) and Israeli couscous, with parsley, currents and pine nuts. My husband who tolerates most of my kale salads raved about this one, a home run. If hubby raved about a kale salad then it must be good! Love Food 52 and all their books! haha! that is for sure, thanks Abbe! I love these types of books that you can use the recipes as inspiration. Nice that you could use home grown kale for your salad. Wish you could share the dressing recipe. Hi Tandy, all I did for the dressing was to use a carmelized garlic and onion jam and mix olive oil in it, fabulous with the kale. Sounds like a great cookbook, or guide, to loads of salads! This kale salad looks wonderful. Thanks Tricia, Food52 puts out such great books, this salad one is wonderful. I too LOVE salads! Have to add this book to my list :-)) Your kale salad looks delicious...now I wonder where I can get this winter veggies in hot summer time..
Hi Angie, it is cool enough in Oregon to grow kale most of the summer, not sure where you live. We eat salad all the time at this time of the year. Main course ones, I mean. Had some last night. :-) This looks terrific -- thanks. Thanks John, we enjoy alot more main salads in the spring and summer, but have some type of salad almost every day. Thanks Monica, yes I am too, love their website. Growing up a salad was lettuce tomato and cucumber, times have certainly changed. Oh, I should eat more salads... I do eat a salad daily but it never changes. Maybe if I had your garden next to me? I'm crazy for salads too and your kale salad sounds wonderful as does this beautiful cookbook! Thanks Chris, Food52 has some great books out there. I love salads and try to eat them often. This one looks like a winner. The cookbook sounds wonderful. Thanks Dawn, anytime I can get my husband to eat raw kale and love it is quite an accomplishment. Thanks Kim, you know I was born in Whittier Ca, sure do miss it. Anyway Mighty Salads is a great cookbook. I must check out this book. I could live on salads, but my husband is a different story. This might be a way for us to find some common ground! When it comes to food I know exactly what you mean about common ground, still working on it here too. Thanks Kris! So jealous that you grow your own kale! I bet it is amazing - it's my favorite green. I make salads all the time and would just love this book! Thanks Laura, leafy greens grow very well here on the coast, feel very fortunate. thanks for helping feed my kale addiction--your version sounds great! Thanks Grace it really was delicious! This truly seems like an awesome cookbook, Cheri! Thanks for the idea! Thanks Agness, it really is. I love salads too, in every season but especially summer when it doesn't seem as heavy a meal on a hot day. This sounds like a terrific cookbook and I envy your kale. I didn't plant it this year but maybe I'll try a late summer crop as the weather starts to cool again. Thanks Susan, yesterday I spent quite a bit of time in the garden repairing plants and the soil appears I have an intruder. Ugh! I'm another who loves salads, especially in the summer. I makes for the perfect lunch and I'm always looking for new ideas. Thanks Amalia, I try and eat one big salad a day, not always successful. Salads are a wonderful and healthy addition to our diet. I like salads but my husband is not a big salad fan. Your kale salad looks delicious and will get the onion jam from Trader Joe's . Thanks Gerlinde, the onion jam is fabulous there is even whole carmelized garlic cloves in it too. I am reviewing this book too! I love seeing what you made and how you made it your own- Looks yummy! It's a great book don't you think, love all the pics! Thanks Marcelle, I'm already fighting with the varmints this year, lol!